On all orders in France. Do you like what you see? Hankook 65ah battery slow charge & victron energy battery charger ip65 charger 12v / 4a-12v / 1a. Ask a question about this article. Maintain very high quality products. We always offer you the best prices. Hankook 65ah battery slow discharge & victron energy charger ip65 battery charger 12v / 4a-12v / 1a. 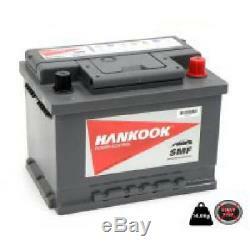 Hankook 65ah battery slow discharge. Total height (mm) - 190. Weight (kg) - 14.3. Caravan, boats, leisure use and much more. This dual-use, slow discharge battery is capable of running applications with these deep cycle capabilities, but also engine start-up. Our range of slow-discharge / marine batteries features lead / calcium technology which means the inner plates have been specially reinforced, providing exceptional starting capabilities and longer life than conventional batteries. This battery is delivered fully charged and ready to use. This battery is a slow discharge, which means that compared to car batteries, they can support a larger discharge without affecting their performance. Another thing to note for these batteries, and that is very important is that when you charge and discharge the battery it has 250 life cycles. Integrated computer system and reinforced container - protection against vibrations and shocks. Special lids - prevents acid leakage and minimizes gassing. No maintenance - no need for addition. Adapted container design and solid polypropylene. 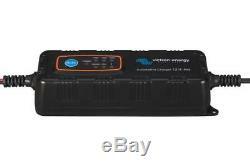 Victron energy charger ip65 battery charger 12v / 4a-12v / 1a. Supply voltage range - 200-265v. "Absorption" charge voltage - 14.4 or 14.7 v. Load voltage "float" - 13.6 v. Charge voltage "standby" - 13.2 v. Charging current - 4 a or 0.8 a. Absorbed return current - 0.25 ah / month (0.3 ma). Protection - reversed polarity, temperature. Operating temperature range -20 to + 40 ° C (nominal output power up to 25 ° C). Humidity (non-condensing) - max 95%. Degree of protection - ip65. Weight (kg) - 0.56. Depending on the application, lugs, eyelets or a cigarette lighter (all inclusive) can be connected to the charger. Less maintenance and aging when the battery is not used: the standby mode. Standby mode is triggered when the battery has not been used for 24 hours. During stand-by mode, the float voltage is lowered to 13.2V to reduce gassing and corrosion of positive plates. Once a week, the voltage is raised to the level of absorption to "equalize" the battery. This function prevents stratification of the electrolyte and sulfation, major causes of early failures of a battery. Protection against overheating and reverse polarity connection. The output current will decrease if the temperature rises to 40ºc, but the charger will not fail. The output relay serves as protection against reverse polarity connection. Five led for indication of status and mode. When the charger is connected to AC power, the standby LED will light. No voltage will be present on the output. After connecting it to a battery (the battery voltage must be higher than 8.5 V), three charge profiles can be selected using the mode button. Current limited to 0.8A and an absorption voltage of 14.4V. The red led <14 ah will light up. 4a current and 14.4v absorption voltage. The red led> 14 ah will light up. Application: batteries with liquid electrolyte, agm or gel. 4a current and 14.7v absorption voltage. The cold red led will come on. Ambient temperature below 10º C, or batteries requiring a higher charging voltage (eg optimum spiral cell batteries). Until the battery is fully charged, the charge LED will be on. After the end of the charging process, the red full led will come on. In case of reverse polarity connection, the red led! The charger always starts in standby mode if it is connected to AC power. Thank you for taking into consideration the fact that we do not deliver Corsican. Delivery is made from Monday to Friday between 9h and 18h. Delivery is made in 1-2 business days if the order is placed before 15:00 in all mainland France. We do not deliver on weekends, our delays correspond to the delays of the carrier so we are not responsible for any delays. We deliver belgium, netherlands and luxembourg at no additional cost, minimum delivery time 48h. We do not deliver the. Corsica, Monaco and the littoral islands. At the time of delivery, please check the condition of the battery. In the unlikely event that the battery has suffered damage during transport that is irreversible, visible and obvious even on the package please refuse the package or make clear reservations about the condition of the goods. The setting up of this procedure is necessary to proceed to an exchange. Items purchased online can be returned to our mouen store within 30 days of purchase. All returned items must be unused and in their original condition. To obtain a refund or exchange, proof of purchase must be provided for the item you wish to return and include it in the forwarded item. By making your purchases on our shop you agree to the terms and conditions indicated below. Opening hours and contact the address of our store is: battery megastore 350 odon street 14790 mouen our phone lines are open from Monday to Friday from 9:00 to 17:00. We can be reached at the following number: 02 31 30 79 02. For any request concerning the follow-up of your order, please dial 02 31 75 07 97. You will not receive an answer during the weekend. Important Warranty Procedure: Be careful, no warranty will be given without submitting your purchase invoice. Before taking any warranty claim, please fully charge your battery to ensure that it is not simply discharged. Regarding leisure batteries, slow discharge or deep cycle the test must imperatively be carried out in our workshops. Battery megastore offers a free test solution, no request for refund of test report invoice can be accepted. No refund of the product will be issued. As part of the legal guarantee of conformity (2 years) without prejudice to any reservations made with the carrier, complaints about apparent defects or non-compliance of the delivered products must be formulated with battery megastore france, written in the 14 days from receipt of the products. The customer will then benefit from a standard exchange which, depending on the case, will be free of charge. Beyond these 14 days and until the end of the duration of the legal guarantee of conformity, any return must be the subject of an agreement with battery megastore france. The customer with a starter battery must either: - allow battery megastore france to test the product in the workshop. The product will be removed by the carrier gls to the address provided by the customer (in metropolitan France excluding Corsica and Monaco) or may be deposited in the nearest agency gls. It must imperatively be properly packaged before the passage of the carrier. The product will be tested in the workshop and the return costs are supported by battery megastore france. Either provide a test report made in a garage (see example below). Written reports or replacement invoices will not be accepted. 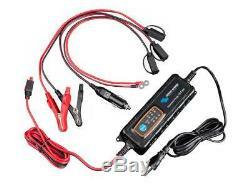 The test must be performed above 12v and the device calibrated correctly (at the correct unit of measure). As part of the commercial guarantee (up to 3 years after expiry of the legal guarantee of conformity) the customer owning a starter battery must either: - allow battery megastore france to test the product in the workshop according to the same procedure as the previous paragraph. Provide a test report made in a garage. The warranty will be invalid in the following cases: - abnormal wear - instructions for use not followed - misuse or storage, negligent or incorrect installation - unauthorized alterations of the battery - use of so-called means of improvement - use electric fences (reduced warranty to 6 months) nb: if you think you have more than one defective battery, please contact our technical team at first 02 31 30 79 02. Right of withdrawal for consumer customers pursuant to Article l. To exercise his right of withdrawal, the consumer must, within the time specified above, send to megastore france a written document clearly specifying his will to retract or return the standard form of exercise of the right of withdrawal to the coordinates indicated in the preamble. The consumer customer must return the products to the address indicated in the preamble within 14 days of the communication of its decision to retract, in perfect condition and in their original packaging, and not used, without any trace or mark, with all possible accessories. The costs of returning the products remain the responsibility of the consumer customer. If all the conditions required for the return of products are not respected, battery megastore france may deduct amounts to be refunded, if applicable, a share of the price of the order corresponding to the sale price of missing or possibly degraded products . We kindly ask you to keep your bill carefully. In the case of a warranty claim, you will be asked to provide us with a copy of your invoice. Responsibility megastore battery is in no way responsible for any harm to life, body and health. In any case, megastore battery disclaims any responsibility for the fact in particular: normal wear of its products deteriorations or accidents due to negligence, lack of supervision or maintenance or improper use of damage resulting from modifications, incorporations or repairs of the product of the damage on the products subjected to abnormal subjections (mechanical, thermal. Availability of products The availability of products is not necessarily linked to the quantity displayed on the site. We do our best to ensure that all our products are in stock. However, in periods of high activity, there may be a break on the products ordered. In this case, we will offer you the possibility of a refund or an alternative product, of identical or higher range, at the same price. Delivery address Once the order has been shipped, we can not guarantee the possibility of a change of delivery address. It is very important to check the shipping address, including the postal code, as well as your phone number. Possible errors in your contact information may cause delays. We do not deliver Corsican, Monaco and the littoral islands. Recovery of waste we may indicate to any customer who requests it a place of deposit or a specialized waste treatment station near megastore battery premises, or any distributor of batteries marketing these products under their commercial name or any other person authorized to recover this waste. In any case, the customer can deposit them in any place suitable for the recovery of this waste. It is strictly forbidden to dispose of batteries, accumulators or batteries in your household waste or to dispose of them in the natural environment. Megastore Battery has been created so that you can easily purchase batteries at competitive prices online or over the phone. We import batteries directly from the manufacturer, which allows us to offer you attractive prices, but also direct access to first quality products. Currently expanding, we offer a wide range of batteries suitable for all types of vehicles: car, motorcycle, camper, caravan, boat, truck. All our prices quoted include vat. Battery megastore is committed to providing a fast and efficient home delivery service to all our customers: industrial organizations, individual. Buying a car battery with us could not be easier, we aim to make the process as simple and straightforward as possible. From ordering your battery to fast delivery the next day, included in the price. Battery megastore has experienced strong growth since its inception in 2000. All this, thanks to our valued customers who have decided to change the mode of purchase of batteries and enjoy a more competitive offer. If you are still not convinced to use megastore battery, check out the following information: - we receive every day many positive comments from our customers - our company has appeared in various magazines and articles - we offer different batteries, depending on the type of technology. We pack professionally to avoid damage in transit - we have a technical team to answer your questions - all our batteries are of the highest quality and are guaranteed your comments are extremely important to us. If you have any suggestions as to how we can improve all aspects of our service, please send us an email directly. Try us, you will not be disappointed. Sign up for our newsletter and receive our offers and tips. Megastore Battery has been created so you can buy cheaper batteries cheaply online or over the phone. We import batteries directly from the manufacturer, which allows us to offer you attractive prices, but also direct access to products of first qualities. 99% of our customers recommend us to a friend. The item "hankook 65ah battery slow discharge & victron energy battery charger ip65" is on sale since Friday, December 7, 2018. It is in the category "boats, sailing, sailing \ deck hardware, engine, parts \ engines, pumps, electricity \ electricity / battery / energy. " The seller is "batteriemegastore2009" and is located at 14790. This item can be shipped to the following countries: france, uk, netherlands, belgium.